The reduction of the crown in height and spread by the removal of branches back to good selective growth points defined by a percentage or height. Good for maintaining over-grown trees. The removal of selective branches within the crown defined by a percentage whilst maintaining the overall shape, allowing more light through reducing the crown. A Victorian method of tree maintenance, the upper branches of a tree are removed, promoting a dense head of foliage and branches, primarily used to maintain trees at a pre-determined height. The complete removal of the tree from the ground level only when there is enough clearance and space to do so. There are normally a number of valid reasons to fell a tree. Either the tree is diseased, dead or has become dangerous and needs to be removed entirely. The removal of the tree by hand in smaller sections usually with the aid of lowering equipment, this method is used to avoid obstacles i.e. sheds and greenhouse’s etc. A traditional method of cutting down trees to ground level and allowing the stump to regenerate and after several years repeating the process, trees which are coppiced are kept in a juvenile state and can last many more years than a tree left to grow untouched. The removal of stumps by means of a mechanical machine called a stump grinder this machine away the stump to a depth to around 4 to 6 inches below ground level all that remains will be wood chips. 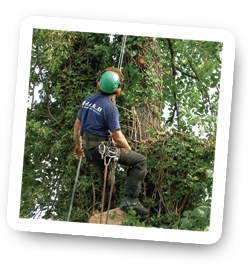 The removal of dead, dying or diseased wood, the main reason for dead Wooding to be carried out is safety, trees that demand such removal are usually old mature trees that overhang properties, public roads and footpaths and gardens. The reducing and trimming of a hedgerow, these are normally reduced to a desired height then trimmed or pruned to achieve a neat, manageable hedge line. This involves the trimming of all types of hedges including conifers. We can reduce the height and sides to give a uniformed look.